The above is VERY IMPORTANT - don't ignore it else you WILL damage your KeyMaker KMX1 or KMX2 board and that is expensive, wastes a lot of time and is not much fun. 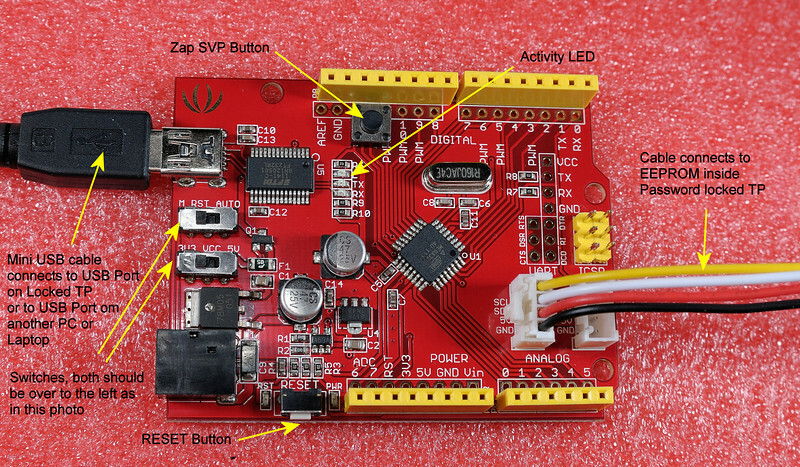 Put simply, do not waste your time trying to use the KMX1 series board until after it has been Activated. Recovering or Clearing a Supervisor Password (SVP) from a TP is fairly straightforward. Once you know how to avoid all the TRAPS IBM/Lenovo have set for you the customer. I know this is all very exciting and you are ready to start stripping down your TP and jump into it, but WAIT! read all of this first. Most people are absolutely certain they have a Supervisor Password (SVP) set. There is a chance you may not have a SVP set in your TP. I have exchanged emails with many people who have gone through all the SVP unlocking thing read the EEPROM, wasted days, only to discover there is no SVP set at all. How is that possible, are these people really dumb or something. The answer is NO, these are all perfectly sane intelligent people. The real problem is IBM/Lenovo and their warped sense of humour. When you really do have strong security, you challenge people to try and defeat it, you invite peer review to make sure it is in fact secure. When you have flimsy pretend security and you obstinately pretend it is so secure even you cant unlock it, well you have to get all secretive and vague about everything HOPING people wont find out, in other words an illusion of strong security where none really exist, which is what we have here. That icon with the small number 1 (it may be a small number 2 or 3 if you have more than one Hard Disk] means the HDP is set. You will not be able to easily recover or clear the HDP, KMX1 will NOT recover or clear HDP. It will cost you more to clear the HDP than a new Hard disk is worth. Clearing a HDP is only worth the expense and effort if there is valuable data on the Hard disk that MUST be recovered. If HDP is set then remove the Hard Disk [HD] before continuing so that you can determine which other passwords (IF ANY) you need to recover or clear. There may not be any other password set! Ok, you removed the HD and you see yet another Password Prompt icon. Does NOT define which PASSWORD it is asking you to enter. Only ONE way to find out for sure which one it is and maybe save a LOT of time. Spend the time to read the first part of the HMM which deals with Cautions some of which like for example Shock Sensors are very important, you would not want to roughly handle your System board to find out when you power it up to unlock it that in fact you have ruined it. After performing POP Removal if there is no password prompt icon displayed, you are done, your TP is unlocked. It means that with POP removed, you have now absolutely confirmed that you do indeed have a SVP set and you can now put the time and effort into removing or clearing it. You must ACTIVATE your KMX1 before it will do anything useful. If you jumped straight in here without reading all of the above information - STOP - and read all the information above FIRST! 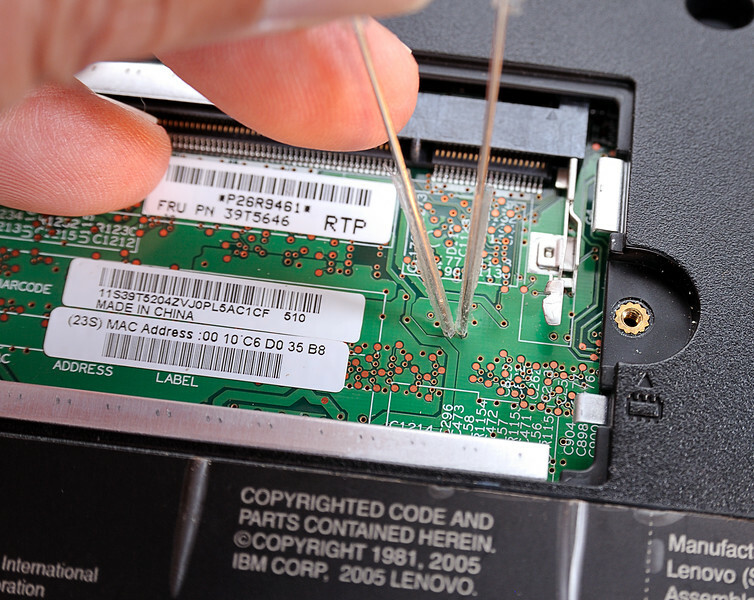 Recovering or Clearing a Supervisor Password (SVP) from a ThinkPad (TP) always involves these steps. 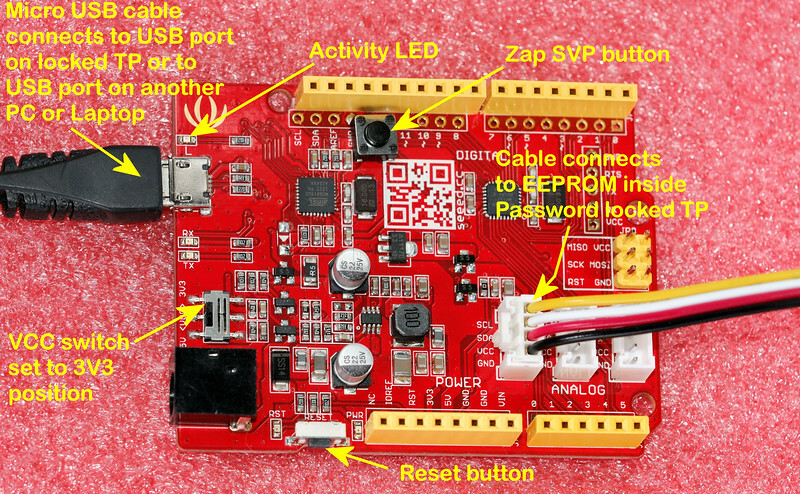 Find the location of the EEPROM connection points and EEPROM Type. Download and save the HMM, then follow the HMM to enable you strip down the TP [without damaging it as you would if you don't follow the HMM] down to the point you can access that EEPROM location, depending on the model this could be ONE Screw or a total strip down. That is the eeprom type you select at this point from the menu for your model TP if you are unlocking an R61, check for your own model and select what that page says is the EEPROM in your model TP. select the command to Recover or Clear your SVP. Most times we only use GND - SCL - SDA and leave VCC NOT connected. When you purchase KMX1 you are supplied with a 4 wire lead. Most of the time you will ONLY be using 3 of those 4 leads. NOTE: The orientation, by convention, much like a car battery, RED is Positive Voltage, in this case it is called VCC. 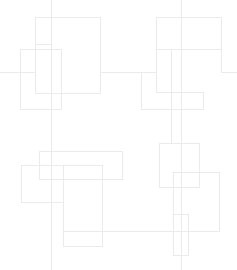 Black is Negative or as we will be referring to it as GND which stands for Ground, in plain English Ground is the negative or common point in a circuit. 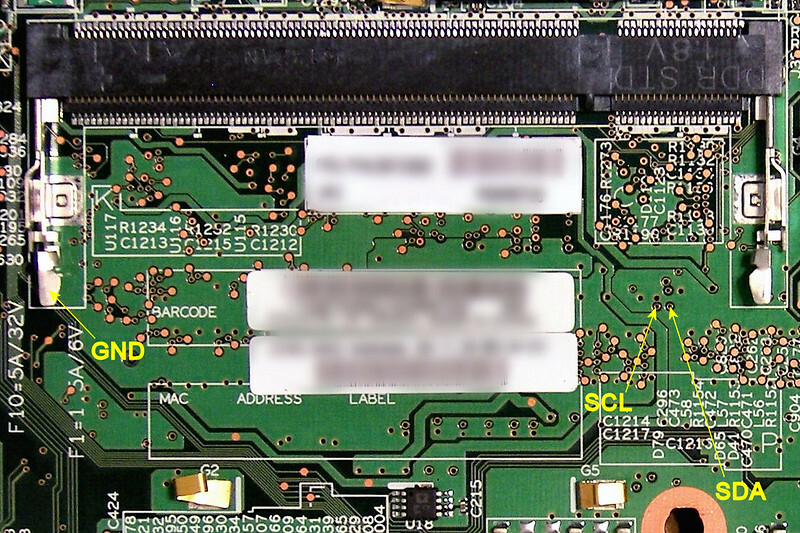 You do NOT connect VCC [the RED lead] unless you are reading an unsoldered 24xx series EEPROM and I can't see you doing that very often if at all unless you run a Laptop Repair Shop. GND which you connect to the BLACK lead above. SCL which you connect to the YELLOW lead above. SDA which you connect to the WHITE lead above. Make it a habit of connecting the 4 wire lead as per above with the RED wire over VCC. Using Sharp Probes, for example multimeter leads that are skinny and come to a sharp point, they also have an insulated handle for you to hold without your sweaty hands interfering with the low power signals on SDA and SCL. Whichever method you chose to make the 3 connections is up to you, so long as there is a good electrical connection during any Read or Write operation between the connection points at both the EEPROM and KMx1 I2C CONNECTOR all is well. It does not get any easier than this! Yes, you can easily do it yourself! If you have read all the preceding information on this page and not simply skipped all that boring IMPORTANT information, - if you skipped it, go back and read all of this page above. Having confirmed it is a SVP, found the location of the EEPROM connection points and EEPROM Type for your TP Model. Followed the HMM to enable you to strip down the TP [without damaging it as you would if you don't follow the HMM] down to the point you can access that EEPROM location, depending on the model this could be ONE Screw or a total strip down. Having found the EEPROM connection point for your TP Model, having decided if you use clips or sharp probes to make the actual connections. The time has come to actually make those connections. If you really really skipped a lot of preceding information, here is a clue, the Terminal software runs on a second PC or Laptop, the USB port on that second PC is connected to KMx1, NOT ON THE LOCKED TP as clearly that is mission impossible! Since some keys are in different places, the password could be different for each keyboard if those keys were used. Use Command 6 first to select your TP keyboard language. KMX1 REMEMBERS the last selected Keyboard Language even if switched off. Pay attention to Selecting ThinkPad's Keyboard if you are doing different Language TPs. 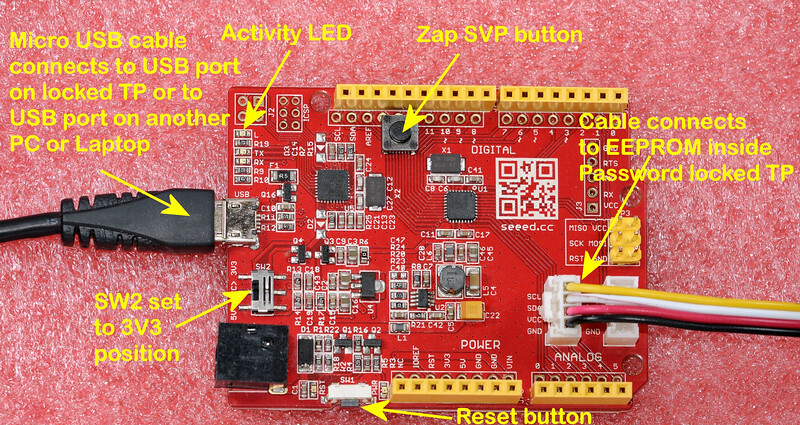 First, you connect the 3 wires (GND, SDA, SCL) from the KMX1 I2C header to the EEPROM connection points on your Password Protected TP. You can solder the 3 wires, or you can use a clip on each wire, or you can use a clip for GND and sharp probes for SDA and SCL. The 3 connections MUST be made to the correct connection points. Double check you have not mixed up the 3 wires. With some models, you will have a totally stripped down bare, yet able to be switched on and run TP for this operation. In that case make sure the metal parts of the keyboard cannot come into electrical contact with any part of the circuitry on the system board you can use paper or plastic or insulating tape to keep things electrically isolated. Make sure you do have attached the CPU heat sink and that the CPU cooling fan is connected and will operate when the TP is switched on, else you will fry your CPU. On some models it helps if you open the LCD screen at 90 degrees and stand the TP vertical so one side of the LCD screen and one side of the Machine are resting on the table surface, that way you can access the front and back of the TP after it is switched ON. If you are using sharp probes to make the connections then you can wait until the locked TP has Powered UP and is at a password prompt before making the connections using your sharp probes. You have made sure nothing can 'short out' ? Plug a mini-USB cable from one of the USB Ports on your unlocked laptop or PC to the USB socket on your KMX1, that will power KMX1. Switch the KMX1 on and run the Terminal software on your laptop or PC, NOT THE ONE LOCKED WITH A PASSWORD, ANOTHER PC OR LAPTOP. 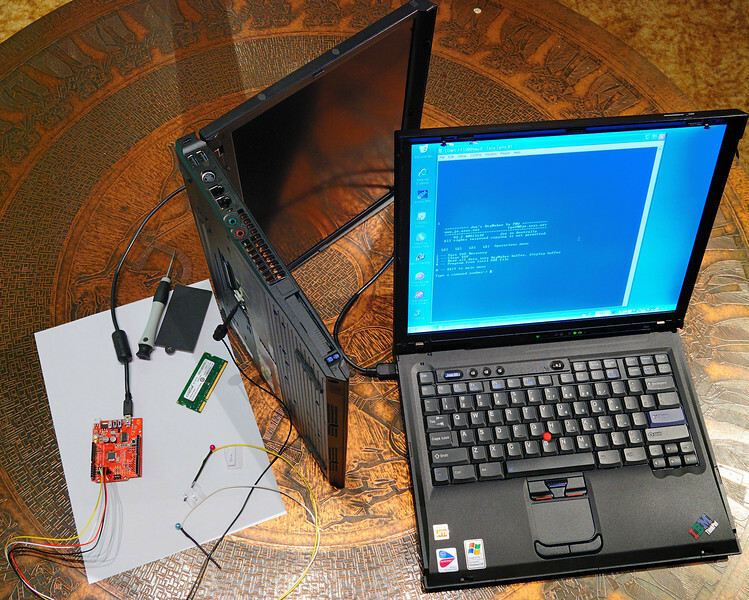 Connect the GND wire from the ThinkPad to the KMX1 I2C interface. Of course you do need to connect some power to the ThinkPad via your TP AC adaptor, else nothing useful will occur. If you don't hear the sound of the CPU cooling fan running, switch off and check it before continuing, normally the fan runs the instant you switch the TP ON, it may stop in the next few seconds, that's OK, so long as it does run at start up you know you have not forgotten to connect it during re-assembly. WAIT until you see the message 'Entering Bios setup' or similarly worded message or you see a Password Prompt icon or you see an error message that is NOT about a boot error. 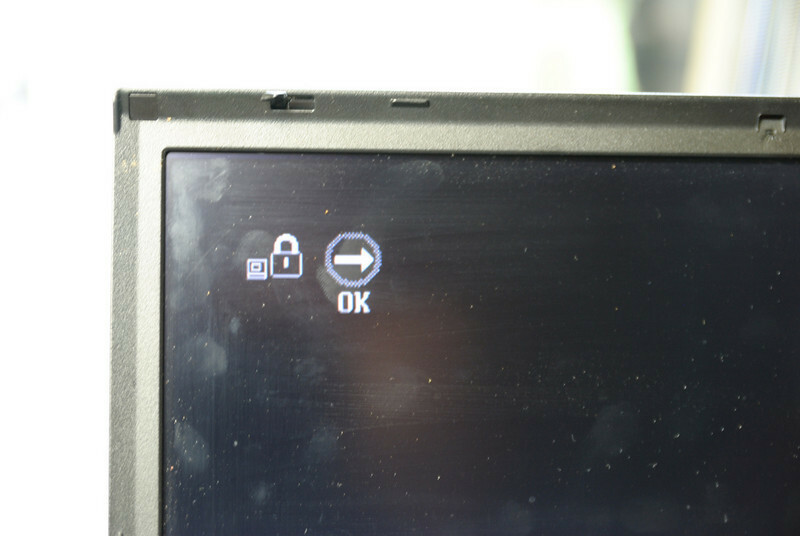 If the ThinkPad has booted to any operating System, switch it OFF and pay MORE ATTENTION, hold down the F1 key and continue to hold it down while switching the ThinkPad ON.. 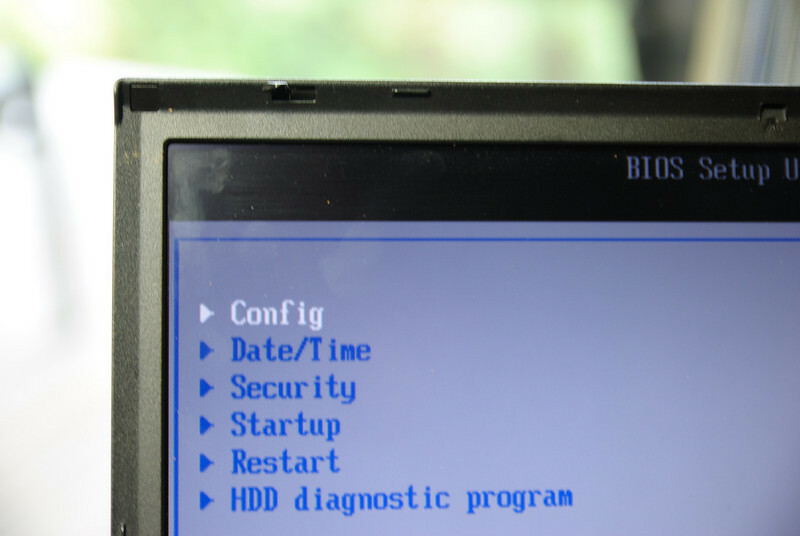 VERY IMPORTANT THAT YOU DO NOT continue unless the ThinkPad is displaying the message 'Entering Bios setup' or similarly worded message or you see a Password Prompt icon or you see an error message that is NOT about an operating system boot error. That means, that like a LOT OF PEOPLE, you are rushing and you completely skipped the important information at the start of this page, please switch the TP OFF, and start reading from the top of this page, this time do NOT skip anything! One final reminder for those in a huge rush who skip important information, you did already follow the POP Removal procedure detailed at the top of this page, YES? That is telling us that the EEPROM TYPE for an R52 is LSI. Go ahead and select your TP's EEPROM type LSI, 24RF08, 24C01, 24C03 or 93C46 from the main menu. Type in the command number for the EEPROM Type in your TP. Depending on the EEPROM Type selected, you will then see either 1 or more Command options. Recover LSI SVP is always the number 1 Command. Do not press a command button before the EEPROM connections have been made. 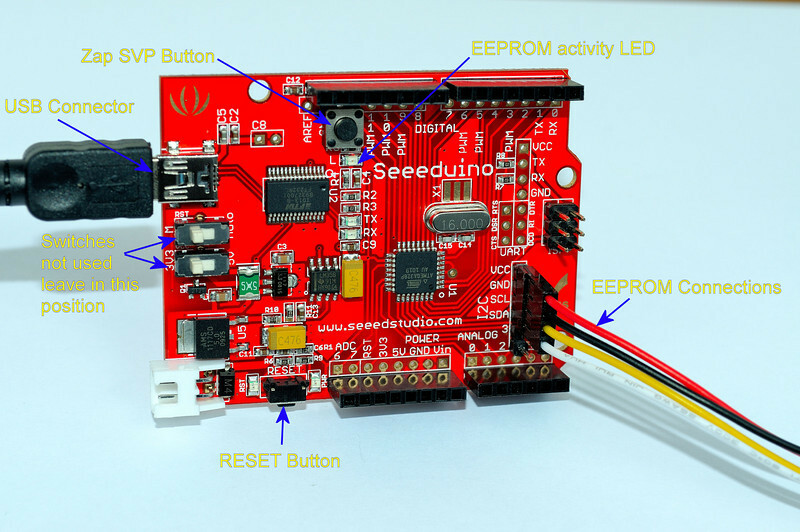 If you are using sharp probes to make the EEPROM connections, you must now apply them to the EEPROM connection points for SDA and SCL, you did connect GND earlier, right?. Now press the command number for the operation you wish to perform and perform that operation. KMX1 has a delay between the time you press a command key which involves an EEPROM operation and the time that operation commences, the delay can be set to 0, 5, 10 or 15 seconds which gives you time to place your probes and concentrate on holding the sharp probes so that there is a good solid electrical connection during the entire operation. If for example we had select LSI as the EEPROM type and then selected Command 1 for Recover LSI SVP we would see the following screen. The copy of the SVP (CSVP) which on some older models contains the Hard Disk Password (HDP) can also be recovered and displayed. NOTE: on newer models, Hard Disk Password cannot be recovered from anywhere inside the TP, the Hard Disk itself internally looks after the HD Password. Now that you KNOW what the Supervisor Password is. Well now you have it! To permanently remove the Supervisor Password, follow the instructions for turning off the password option in the setup. To avoid confusion between different language keyboards, you can select which Keyboard language you wish to use to display your recovered passwords, see sample Screen Shots further down at the foot of this webpage. As you can see in the screen shot above, command 2 lets you Clear LSI SVP. This will clear ANY password including the encrypted TPM/TCPA SVP or as some people call it Reset TCPA. You press the 2 key, a message appears asking you if you are ready to Clear SVP, you type Y for Yes. A few seconds later there is no longer an encrypted SVP and TCPA has been reset. you will see the screen below, see - NO SVP, gone as if it never existed. CAUTION: IF your laptop is set to boot over a Corporate Network then do not tinker with BIOS setup unless you know the required settings for your Corporate network. If you have had to clear SVP then (subject to the Caution above) you should while in BIOS setup, SET DEFAULT setting, the F9 key does that, select BOOT and also set defaults there by using F9. Then Press F10 to SAVE those settings, switch the TP OFF and switch it back ON again to continue using it. Those last F9, F10 steps above are VERY IMPORTANT else you may see errors reported, your TP may not find the Hard Disk to boot from etc. 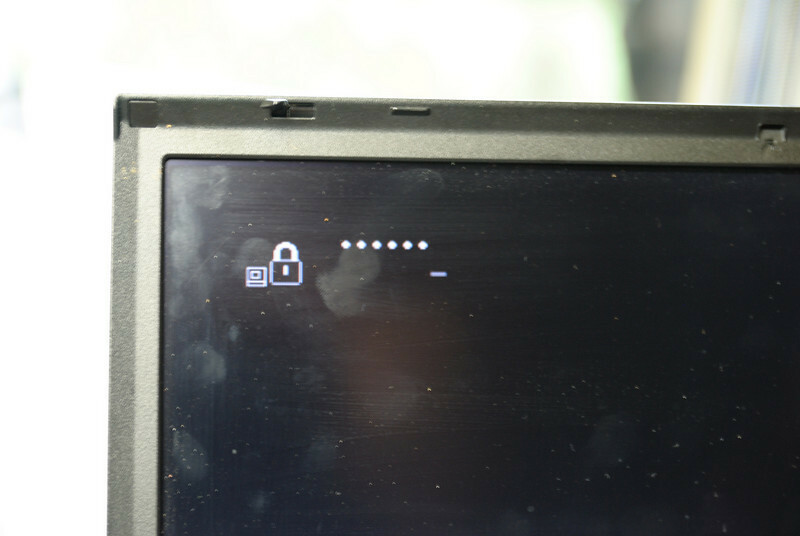 In the display above *BLANK* means that there is no SVP set, the * (asterisk) on both sides of a MESSAGE is used to indicate that the word displayed is not a recovered password. You may also see *NVPC** which stands for No Valid Password Characters. 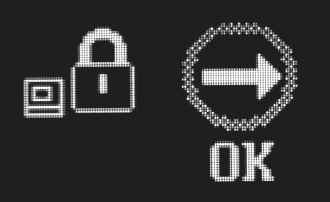 The * character can never be typed in as a password character on any TP, so it is used on either side of a useful message when you go looking at the recovered SVP. If you see *BADCS* or *NVPC** that is usually an indication that the TP has an encrypted TPM/TCPA passwords set, your obvious option at that point is Clear SVP. When using KMX1, connection leads to the EEPROM inside a TP can be connected whilst the TP is switched OFF or ON, the leads can be left connected while the TP is being switched ON and OFF. KMX1 EEPROM connections do NOT have those restrictions because the KMX1 EEPROM connection points are High Impedance, they do not load down the signals, therefore they can be left connected at all times without affecting TP power up or power down.